On the outskirts of Nottingham, about 200km northwest of London, the University of Nottingham stands among the woods and rolling grassland. As a member of the UK's prestigious Russell Group, the University of Nottingham ranks among the world's top 100 universities and the British top ten universities. It has won the Queen's Award for Enterprise and the Queen's Anniversary Prizes for Higher and Further Education. Currently, over 2,000 Chinese students are studying at the University. 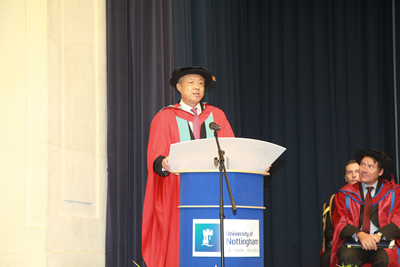 August 2017 came with an exciting news for the Chinese students of the University of Nottingham: the University would award an honorary doctorate of law to Chinese Ambassador Liu Xiaoming, and a special degree conferring ceremony would be held in recognition of Ambassador Liu's exceptional achievements in his over 40 years' diplomatic career and his outstanding contribution to the development of China-UK relations. Demand was high for a place at the ceremony where Ambassador Liu was going to deliver a speech. The Great Hall, which can accommodate more than 200 people, was chosen for the occasion. On September 6, the beautiful campus at Nottingham was bathed in autumn drizzle, where flocks of gulls glided over the lake, and colors of fruits twinkled between the branches. The harvest season was drawing near. This was the day of the degree conferring ceremony. 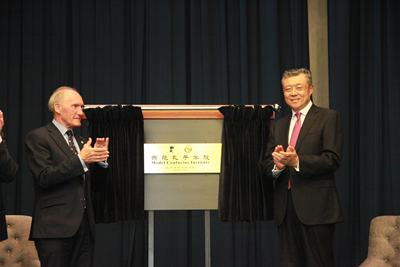 Attaching great importance to this event, Vice Chancellor Professor Sir David Greenaway and five Pro-Vice Chancellors greeted Ambassador Liu Xiaoming and his wife Madam Hu Pinghua and attended the ceremony. Such attendance was exceptional in the history of the University. The ceremony started at 9:00 am. When the solemn and elegant music sounded, Ambassador Liu, Vice Chancellor Greenaway and 15 members of the Senate Committee of University of Nottingham formed a procession which was led by the scepter symbolizing academic authority slowly into the hall. Warm applause burst out in the fully-packed hall, especially from Chinese teachers and students. Applauding, according to one of them, is their way of expressing admiration for Ambassador Liu and pride for being Chinese. Vice Chancellor Greenaway delivered a warm speech commending Ambassador Liu on his contribution to China-UK relations, especially to the people-to-people and cultural exchanges between the two countries. Professor Kevin Lee, Senate Member and Head of the School of Economics, briefed the audience on Ambassador Liu's exceptional achievements in his diplomatic career, and spoke highly of his important contribution as an outstanding diplomat to China-UK relations, particularly his dedication to promoting the cooperation between the University of Nottingham and its counterparts in China. On behalf of the Senate Committee, Professor Lee read out the decision on conferring an honorary law doctorate on Ambassador Liu. 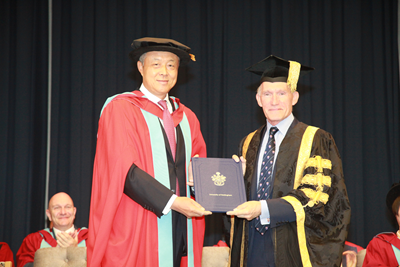 In a red gown and black velvet bonnet with a golden tassel, Ambassador Liu took the doctoral certificate from Vice Chancellor Greenaway and delivered a speech entitled Build World Peace and Prosperity on Wisdom. He first emphasized that this honorary degree was not only an honour for himself but also the recognition of the work of the Chinese Embassy in the UK. More significantly, it represented the University's strong commitment and remarkable contribution to the educational cooperation between the two countries. Recalling his ties with the University of Nottingham when was the Chinese Ambassador to Egypt and his working experience in the UK in the past seven years and more, he focused on three key phrases: "use of wisdom, love of the motherland, and global vision". The ambassador began his speech with the University's motto, A City Is Built on Wisdom, which carries the belief that wisdom is the most precious thing and the foundation for personal growth and success, and that only wise men are true warriors, and which encourages the students to pursue the truth with wisdom. Ambassador Liu stressed that wisdom not only comes with maturity and lays the groundwork for success, but also is indispensable for building friendship between people and between nations. It has been an honor for himself to witness, experience and personally contribute to a thriving China-UK relationship, which has since 2015 when Chinese President Xi Jinping paid a successful State Visit to the UK entered a "Golden Era" and been upgraded to a global comprehensive strategic partnership for the 21st century. Never before has China-UK relationship been so strong and close as it is now. However, the China-UK relationship has not been free from problems. 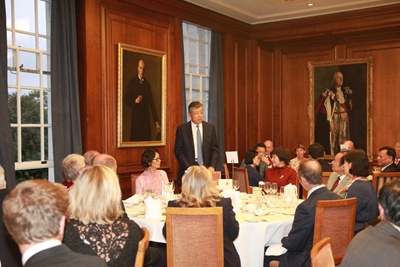 Ambassador Liu noted that like building a city, building sound China-UK relations as we enjoy today was no easy task. China and Britain are two nations differing in history, heritage and social system. So, it is only natural that the two countries do not see eye to eye on every issue. It is only inevitable that sometimes there are different views and ideas. In dealing with these differences, the motto of the University of Nottingham offers food for thought. China and the UK should seek common ground while handling differences with wisdom, and always work to build their relations on foundations of wisdom. Using wisdom to promote relations requires both countries to meet each other halfway. The University of Nottingham has shown considerable foresight in recognizing the tremendous opportunities brought by China's development. The University has always played a leading and exemplary role in the educational exchanges between our two countries: it is the first British University to appoint a Chinese Chancellor and to set up a joint campus in China; it is one of the first to include China as an important source of students, and now it is home to more than 2,000 Chinese students; and it is a leader in the study of contemporary China; the Nottingham Confucius Institute is named a Model Confucius Institute. Lisa Stocks, Executive Officer to the VC and the University Executive Board told Ambassador Liu that the continued success of cooperation between the University and China could not have been achieved without the concern and support of President Xi Jinping. In 2004 when the University of Nottingham Ningbo China was first established, President Xi, who was then Secretary of Zhejiang Provincial Party Committee of CPC, attached great importance and gave his personal commitment to it, which had been a great encouragement to the University. The university was determined to live up to President Xi's expectation. 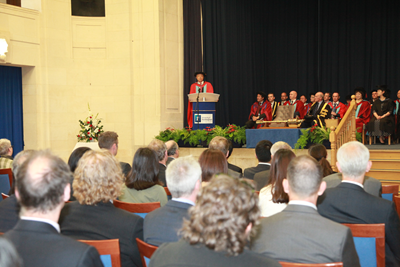 Over the years, Ambassador Liu had attended in person the opening ceremonies of Si Yuan Centre, the 10th anniversary of the University of Nottingham Ningbo China and the launch of the Nottingham Model Confucius Institute, and had given them strong support. The University is deeply grateful for that and will continue to "play a leading and exemplary role in the educational exchanges between the two countries". Ambassador Liu said that he would report the University's cooperation with China to President Xi at the earliest opportunity, and was convinced that President Xi would be very pleased with these achievements. Ambassador Liu also recalled his over four-decade long diplomatic career. He said emotionally that he had six overseas postings in four continents: Africa, America, Asia and Europe. "But wherever I go, my heart is always with my homeland, China. Without a strong and prosperous homeland, any individual success would be meaningless. For a diplomat, no individual behavior is really individual. Whatever you do, you represent your country," said Liu. At the end of the ceremony, the national anthems of China and Britain were successively played. Hearing that the band of the University had practiced the Chinese anthem late into the night, Ambassador Liu was moved, "For countless times in my diplomatic career I have heard the national anthem played, and twice I have been deeply moved. The first time was when I presented my credentials and reviewed the guard of honor as Ambassador to Egypt, and the second time is today's award ceremony. As a Chinese diplomat, when the national anthem is played for me in a foreign country, I know that my work is recognized, and more importantly, I am proud of the development of my country." The Chinese teachers and students at the University were also excited to hear the solemn national anthem played. An old professor shared his thoughts upon hearing the Chinese national anthem on campus for the first time since he came to teach at the University of Nottingham many years ago. Complaining about media distortion of China, he said, Ambassador Liu' articles and interviews offered food for thought and clear-cut and convincing counter-balance and did his country and people proud. A fresh man spoke about how his love for the country has grown since leaving the motherland to study in the UK more intense. At the preparation meeting before his departure, he watched the video speech by Ambassador Liu in which the Ambassador quoted a verse: "Were it to benefit my country I would lay down my life; what then is risk to me?" Studying in Britain, he felt deeply that patriotism is by no means an empty talk. When the national anthem was played, he was moved to tears. He was not only proud of being a Chinese, but also eager to do something for the motherland and for China-UK relations. Ambassador Liu had many fans in the audience who had watched many times Ambassador Liu's BBC interview on the issue of Japanese militarists, and thus, had had a reverence for diplomats and had come to meet the Ambassador in person. The students felt inspired by the example of Ambassador Liu to study hard and contribute their part to China-UK friendship. In closing, Ambassador Liu quoted the words of D.H. Lawrence, a famous Nottingham alumnus and British writer: "Instead of chopping yourself down to fit the world, chop the world down to fit yourself." He expressed his sincere hope that the young people of both countries would take a global vision, meet the changing and challenging world head on and prove their wisdom and capabilities. Ambassador Liu also highly recommended to the teachers and students a popular documentary called China's Diplomacy. He briefed the teachers and students on China's diplomacy under the leadership of President Xi Jinping and noted that as China's economy grows and as the major-country diplomacy with distinctive Chinese characteristics unfolds, China will be able to contribute more wisdom and solutions to the cause of world peace and development. He hoped that the students would contribute their wisdom and capability to building world peace and prosperity and creating the community of common future for all mankind. After the ceremony, the audience came forward to talk with Ambassador Liu and capture the warm and memorable moments on camera. The rain outside had stopped, and a rainbow was just visible between the lake and the autumn hills. The spectacular autumn colors at the best time of year were exceedingly rewarding to all those who have worked tireless for China-UK friendship and seemed to wish for the enduring friendship between Chinese and British peoples and the "Golden Era" of China-UK relations.